Gameweek 37 team. 166 points! I have been playing Fantasy Football for many seasons now – with mixed results but mostly I do fairly decent. Nothing like top 10,000 or anywhere near the very top but decent. Its got more popular as the years have gone by and now there are over 4.5 million teams in the league. When I first in 2006, I reckon there was about 500,000-1m – just a rough guess but I came about 80,000th overall. Anyway, this week was double gameweek. And what a double game week! This gameweek there was I believe 10 teams with double game weeks. Now, since it was such a big double gameweek, lots of other teams would have double similar things. The average score each week tends to be around 50 points but this week was 81 points. And in any “normal” week, if you get more than 100 points, you are doing very well. The highest score this week was a massive 223! I got well over 100 points – I got 166 – which is one of the higher scores – 72,302th highest score of the game week. Its mostly thanks for a few players like Sanchez, Kane and Jesus. A few OK scores but actually a good few pretty poor ones. The biggest let down was Gabbiadini who scored 0 (zero). He didn’t play one game and in another missed a penalty. 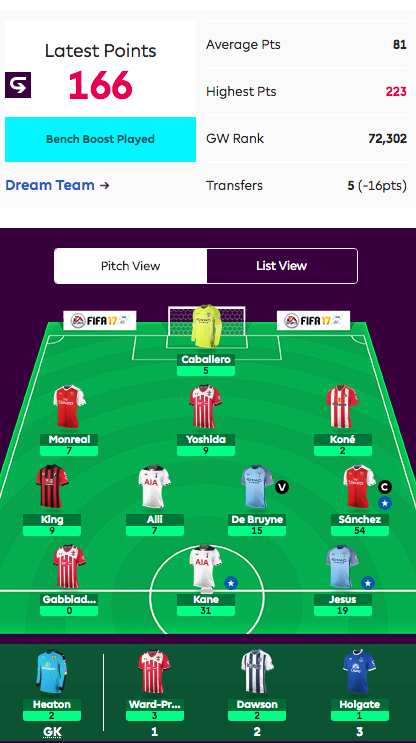 I had spent the previous week (and this week) making transfers into my team (which results in points deductions – you basically get 1 free transfer a week). I took a 16 point hit this week alone. However, I thought it would be worth it for the potential gains. I also played the bench boost so to get max points but the points on the bench were awful really with average of 2 points each. But 166 points is easily the highest score I have ever got in #FPL and my game week rank of 72,302th is one of the highest. Not the highest but up there. Unfortunately its been a poor #FPL season for me, with November being particularly bad. I was never going to win the whole thing – but its about the mini-leagues you are in playing against friends. In my own league I have gone up in position this week even though several other teams have some very high points. But the chances of me getting higher (and beating a couple of my best mates) are slim – basically impossible for one friend who is more than 100 points ahead. One friend is about 35 points ahead. Very slim chance. I’ll just need to pick the right captain, hope he scores loads and hope he picks the wrong captain!